Alcatel makes the Mobile World Congress in Barcelona a great party. In order to pick up the young generation of mobile phone users, the French company has devised something special: the back of the smartphone A5 has built-in LEDs and turns the device into a kind of stroboscope for the pocket. But it is not just parties that are going to get it going, there is also a practical benefit behind the technology. The numerous points on the back of the A5 are by no means only due to the design, they separate the LED lighting into small fields, which light up on request. The lights can be controlled and configured via the smartphone. This allows each user to program their own patterns and color mixes. These are finally used for notifications. If the Facebook Messenger is a new message, for example, a bright blue "F" on the back of the smartphone. At the party the smartphone provides for a lighting show according to a given pattern or the beat of the music. Under its unusual cover, the Alcatel A5 LED hides modern mid-range technology. There is an eight-core processor and 2 gigabytes of memory to provide enough power to play videos and games. The output is via the 5.2-inch display with simple HD resolution. 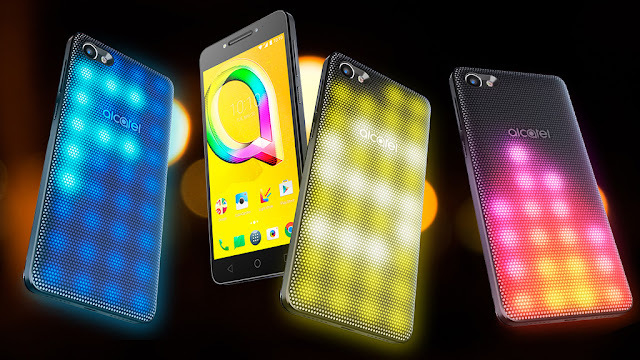 The manufacturer attaches particular importance to fine quality at Selfies: Alcatel installed a 5-megapixel front camera, which with a special Selfie-Blitz to ensure good light in the club. The post-processing of the photos takes "Face Beauty" - and "Face Show" baptized software. The lens on the back snips with 8 megapixels. Photos can be stored on the 16 gigabyte internal memory or on a microSD card. Although the Alcatel A5 LED with a selling price of 199 euros is cheaper than a professional LED stroboscope (around 700 euros), but the output power can hardly be compared. As a party gag, however, the technique is always good. While the front of the smartphone is only available in black metallic, the cover for the LEDs can be ordered in black or silver metallic. Market launch for the color mobile phone is May 2017.